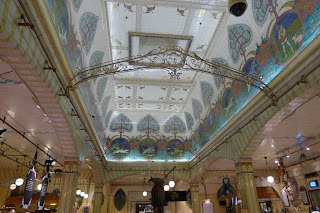 Join us for our next easy going ride on Saturday 27 July 2013 when we will be cycling around London looking at Art Nouveau architecture. 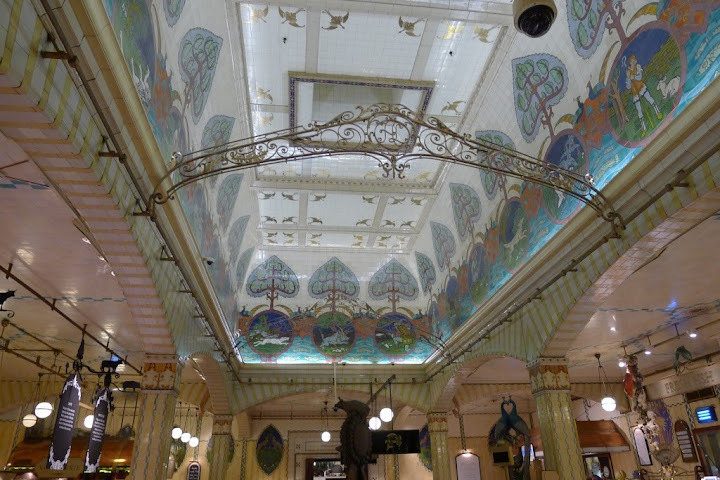 Despite its origins in Britain, Art Nouveau is a rarity in England. This ride will uncover all the known works of Art Nouveau in London running through central London from Westminster to Aldgate and end at Blackfriars. This ride will be led by LCC's Tom Bogdanowicz and last approximately three hours. There will be an optional trip after the ride to visit the Watts chapel in Compton village near Guilford - we will be catching the train from Waterloo. Due to restrictions on the trains only six bikes can be carried - if you want to be certain of getting on the train please bring a folding bike (Bromptons can be hired at Waterloo Station subject to availability). If you wish to go to Compton please email tom@lcc.org.uk - this, unfortunately, won't create more spaces but will give us an idea of numbers. Although Macmurdo’s floral book cover of 1883 is considered the first example of Art Nouveau the style never had a wide following in England. Instead we saw the earlier flourishing of Arts and Crafts which, like Art Nouveau, drew inspiration from the design philosophies of Ruskin and Violet le Duc. Both Ruskin and Le Duc were reacting to the dominance of classical architecture and argued for a return to more national design roots from the Medieval period and a more functional design of buildings. Art Nouveau in building design is generally assumed to start with Victor Horta’s Hotel Tassel in Brussels of 1892. Better known, is the ‘whiplash’ style developed by Hector Guimard, most notably at Parisian metro stations. Guimard’s work for the underground as well as Horta’s largest building - Maison du Peuple for the Belgian Workers Party - are examples of Art Nouveau in the public building arena as opposed to expensive homes for private clients. The latter’s ‘decadence’ and flamboyance (and Hotel Solvay by Horta could be cited as an example of gross opulence) is, somewaht unfarily, given as a reason why the style did not flourish in England. (Voysey’s Arts and Crafts may have less flamboyant but they were undoubtedly very large and luxurious). But for the outrageous wanton destruction of Horta's Maison du Peuple in the 70's that building would have stood as a grand monument to the more popular aspirations of early Art Nouveau architects. The ride will look primarily at the work of WJ Neatby (Harrods Food Hall , Orchard House and Fox and Anchor) who generally worked on facades and interiors even though he was qualified as an architect, and sculptor Alfred Gilbert who is best known for Eros (anteros) in Piccadilly. We will also see the only building by Britain’s only full-on Art Nouveau architect (William Walcott) though, unfortunately, this post-dates his pure Art Nouveau buildings which are all in Russia. In addition we will stop off to see the work of Charles Townsend, who likely would prefer to be considered an A&C architect, but can’t conceal his love of the floral and organic forms that characterise Art Nouveau. 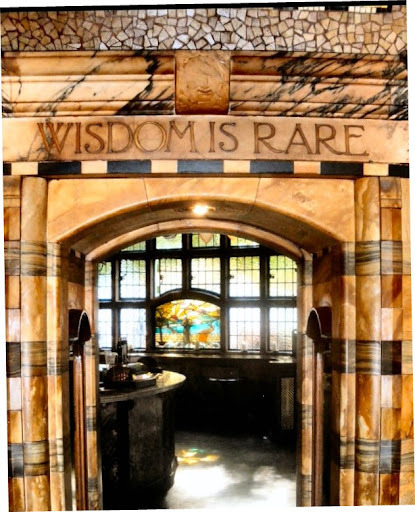 There will also be an opportunity to see two facades by MacMurdo, who may have invented the floral whiplash style on paper but built in a much more conservative manner, and the curious Black Friar pub by Fuller Clarke. For obsessives the full London Art Nouveau tour should probably include Navarino Mansions in Hackney which have quite distinct Art Nouveaus balcony railings but there are no A.N fittings or fixtures inside the buildings. The Watts Chapel by a woman architect (Mary Watts) is an eclectic mix of Art Nouveau, A&C and the Byzantine. See the Compton village website for more details. .